This Kenya safari accommodation in Tsavo East can be accessed on fly-in and self-drive adventures. Mombasa is nearby for safari and beach holiday combinations. You can see a wonderful selection of African animals on a Kenya Wildlife safari at Satao Camp. Tsavo East National Park is home to Elephant, Lion, Buffalo, Leopard, Cheetah and Serval, as well as Striped Hyena, Giraffe, Kudu, Oryx and Impala. 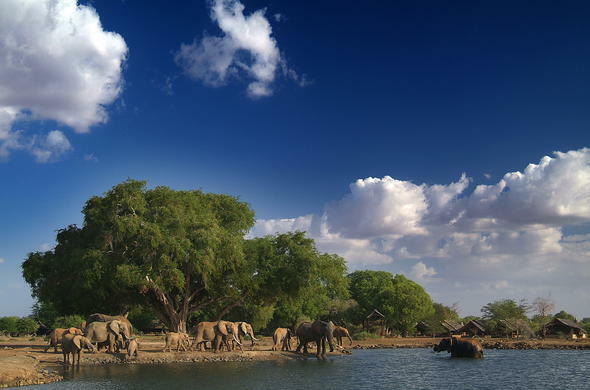 Tsavo National Park is made up of 2 halves, of which Tsavo East is the bigger. Tsavo East is less developed and has a remote feel to it. The landscapes include open plains and bushy grasslands alternating with Acacia scrub and woodlands. The Galana River has lush riverbanks and leads to the Indian Ocean.